"Sugar" Jackson Osei Bonsu, 43-5-1, won a unanimous decision over Jimmy Colas, 31-9, to win the vacant EU jr middle title in the headliner of BFN's show at the Lotto Arena last night. Jackson won on scores of 119-109 twice and 119-108 and the judges were generous to give Colas even one round. Colas came in with a battleplan and that was to wear down the local man and expose his reportedly fragile chin. But in order to hurt a man one must hit him but Jimmy was very much aware of Jackson`s fearsome power and protected himself well but didn´t scor with enough punches to win rounds let alone hurt his opponent. Jackson stunned Colas in the fifth, seventh and ninth. 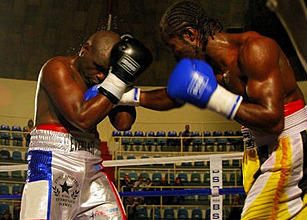 In the final round Osei Bonsu hurt Jimmy with a right and the Frenchman retreated and sat down against the ropes to take a count. In the co-headliner Delfine Persoon won the vacant IBF female lightweight title by stopping Australian Erin McGowan in the seventh. McGowan looked strong and powerful but was too slow for the Belgian and soaked up a bad beating along the way. In the seventh she was floored and as Persoon followed up the referee stopped it. Hadi Melloul won the vacant Flamish lightweight title with a technical decision over Wesley Hertoge. Melloul outclassed his opponent until heads clashed in the sixth leaving Hertoghe with a bad gash over the right eye and Hadi with a cut on the back of his head and it was stopped.